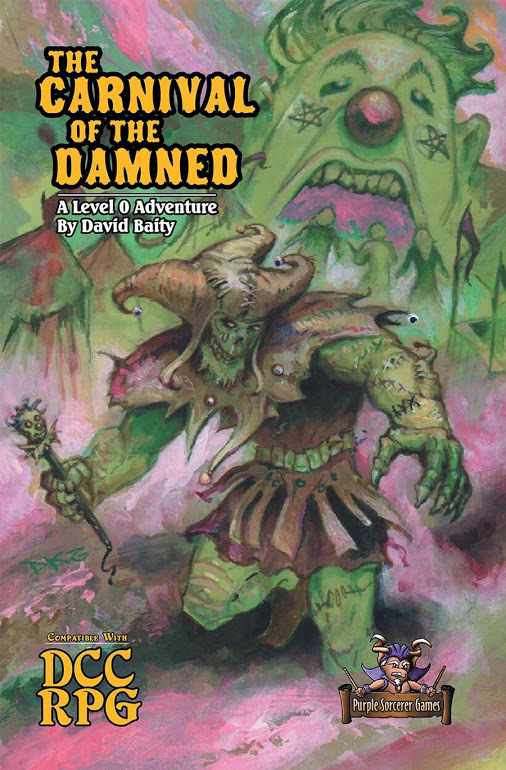 Purple Sorcerer has just announced the release of Sanctum Secorum co-host (and mighty Bacon Wizard) David Baity’s The Carnival of the Damned in both print and PDF! “David has created something special: polished at conventions like Gary Con and Dragon Con, the adventure sports 143 digest-sized pages of clown-filled creepiness that can be used for DCC tournament play, as source material for many standard funnels, or as a massive pool of nightmare encounters that can be unleashed individually on any old-school campaign. Featuring an awesome Doug Kovaks cover, the adventure is filled with incredible art from Simon Todd, Stan Reed, Danny Prescott, and Todd McGowan. I think you’ll love the look. The adventure is available via RPGNow or the Purple Sorcerer Games website at $9.99 for PDF of $14.99 for print of print/pdf combo.